One of the products we are proudest of is our cyclonic sheds. Recently, we went to Karratha to install an entire cyclonic rated commercial development. We offer a wide array of industrial and commercial cyclonic sheds to the Perth area, and we were very excited about this one. 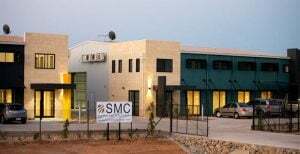 The client, SMC Building and Development, had very specific needs and requirements for the build ing. They needed a cyclonic rated commercial development with both firewalls that allow the entire shed to be built on a boundary. The office section also needed special cladding. By the time we were finished, this turned out to be an aesthetically amazing project. The client was very happy with their cyclonic commercial shed development. They gave us some very nice feedback for which we would like to thank them. SMC was especially impressed with our product knowledge, and specifically cited our experience as a shed builder and supplier. One of the reasons that we were chosen for the job was our quick response time when they first asked us for a quote. We feel that we are able to give solid quotes with detailed information faster than anyone in the industry. SMC felt the same way, and told us that our fast and accurate quote was pivotal in their decision to award us the contract. When it was time to do the job, we went in very prepared. This preparation allowed us to easily meet all deadlines for the project, not only for engineering, but for approval documentation, materials, and completion of the project. We carry a full range of standard cyclonic commercial and industrial buildings in stock at our facility in Perth. We have a display building that you are welcome to visit if you would like to see for yourself why we get so many compliments and such great feedback. If you can use a standard kit building, we can fit most of them on the back of a semi. The structural components of our buildings are stored and transported in containers for safe transportation. We will be happy to build a cyclonic commercial building for you on any site in Australia. To arrange a visit or to learn more, call 1300 778 628.